Yesterday, MaryJo had a late afternoon dental appointment and I wasn’t sure how she would feel after it. 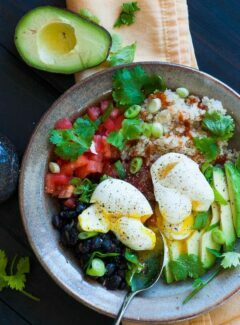 I just figured that something soft would be best, so I made this Tex-Mex style quinoa brown rice grain bowl. Ingredients in a grain bowl could be just about anything you can think of. Basically you want a grain, vegetables, and protein to form a balanced meal. Add to that perhaps something with a crunch and then some contrasting flavors. A lot of these ingredients might be leftovers that you have in the fridge. You can pretty much use what you like. 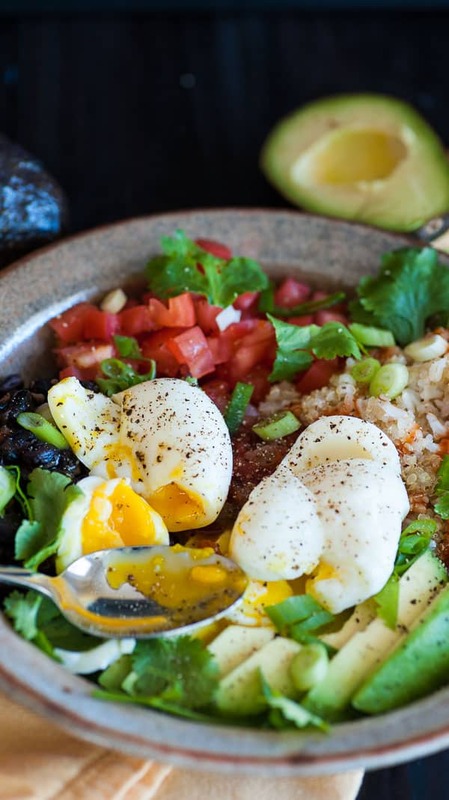 The elements that I put together included: brown rice mixed with quinoa, chopped tomatoes, black beans with caramelized onions, avocados, green onion, cilantro, and soft boiled eggs. For some flavor enhancement, I drizzled some Ortega taco sauce on the rice/quinoa and beans, and put a large dollop of Herdez salsa in the middle to get mixed in with everything else. I topped the whole thing with a couple soft boiled eggs for additional protein. Mix the ingredients together to your liking, and enjoy the great flavor combinations. While we were eating I mentioned that I should have included some cut up fried tortilla strips for some crunch. Dang…I forgot about the crunch part! A little shredded cheddar cheese might be nice too. All in all, this is a simple meal with some awesome flavor. MaryJo thought it was perfect for her still semi-numb mouth. Buzzfeed’s Hannah Loewentheil featured this as one of the “23 Recipes That Will Make Cooking Alone Fun.” If that is your situation…cooking or eating alone, this recipe makes one serving. Next time you are in a quandary about what have for supper, give this dish a thought. 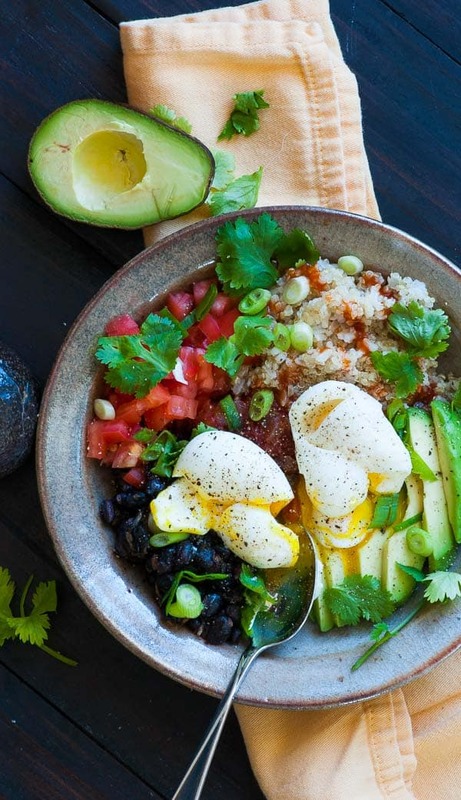 Tex-Mex quinoa brown rice grain bowl is delish. 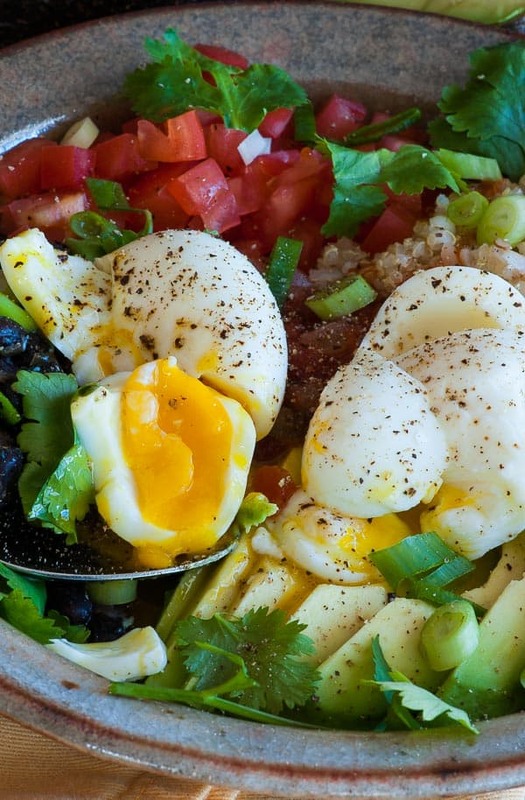 Tasty one bowl meal that's packed with protein. Dice a medium onion and place in a skillet with 1 tbsp vegetable oil and cook on medium low heat while stirring occasionally to caramelize the onion, 10 to 15 minutes. Open a 14 oz. can of black beans and put in a strainer and rinse. Quarter a plum tomato lengthwise and use your thumb to remove the seeds, then dice. Assemble the grain bowl as desired, drizzle with taco sauce and lightly salt and pepper the dish. The nutrition information and ingredients are based on 1 serving. I used regular brown rice which takes 40 or 45 minutes to cook. 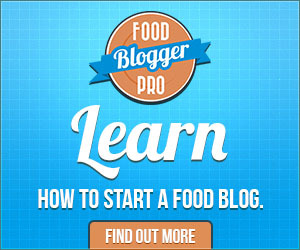 You may want to use a microwavable package of rice to dramatically save time making this. This dish looks really tasty, especially with the soft boiled eggs, (which I haven’t had in decades). However, I will not wait to go to the dentist to try it! This was a perfectly delicious meal after 90 minutes of dental work to get a crown!